Checkout a larger version of the map here. 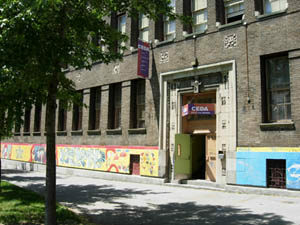 i) the CEDA (2515, rue Delisle), an adult education and community center based in Little Burgundy/St-Henri, site of the Bookfair for the past 9 years; the main floor of CEDA is accessible to people using wheelchairs; the 3rd of CEDA, site of Art & Anarchy, is not. Please note: The CEDA entrance for people needing to use the wheelchair ramp is via the rear parking lot to the left of 2520, avenue Lionel-Groulx, before Vinet, but after Charlevoix. 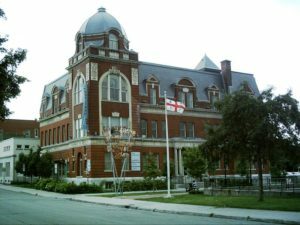 ii) we also use the Georges-Vanier Cultual Center (2450, rue Workman) across from the CEDA, which is an entirely wheelchair accessible space. This metro station is wheelchair accessible (there is an elevator to both platform levels). This will only be useful if you are coming from one of the 6 other wheelchair accessible metro stations (Montmorency, de la Concorde, Cartier, Berri-UQAM, Henri-Bourassa or Côte-Vertu). Please note that all of these stations are along the orange Line of the system. Lionel-Groulx Metro is also a major hub for buses. The following buses stop at Lionel-Groulx Metro during the regular daytime schedule. Beside each is a link to the online schedule. On the schedule, wheelchair accessible buses are marked by a star ( * ). The Montreal Anarchist Bookfair organizing collective acknowledges that we are on the traditional territory of the Kanien’kehá:ka. The Kanien’kehá:ka are the keepers of the Eastern Door of the Haudenosaunee Confederacy. The island called “Montreal” is known as Tiotia:ke in the language of the Kanien’kehá:ka, and it has historically been a meeting place for other Indigenous nations, including the Algonquin peoples. The Anarchist Bookfair collective believes it’s not enough just to acknowledge the keepers of this land. We encourage everyone participating in the Bookfair to get informed and educated, and to actively resist colonialism and neo-colonialism in the many forms it takes, and in the diversity of forms that resistance can take too.